How Do You Treat Mental Illness in a Bonobo? Brian is a male bonobo who was born at the Yerkes National Primate Research Center, but spent most of his life at the Milwaukee County Zoo. His childhood was rough, thanks to an abusive father, and as he transitioned into early adulthood, his prospects seemed grim. When humans suffer mental illnesses, we can talk to our therapists, discuss our problems with them, and participate in our own treatment. But it isn't so simple when the patient doesn't speak. The staff at the zoo turned to Harry Prosen, chair of the psychiatry department at the Medical College of Wisconsin. Brian became his first non-human patient. Prosen first prescribed Paxil, to help with Brian's anxiety, occasionally supplemented by Valium, on the bad days. "The beauty of the drug therapy," Prosen told Braitman, "was that the other bonobos could start to see him for who he really was, which was really a cool little dude." Meanwhile, Prosen and the zookeeping staff began Brian's therapy, focusing on making changes to their own behavior and his environment. They spoke quietly and moved slowly and consistently. No sudden movements or loud noises. They made each of his days exactly the same, and only introduced new things slowly and deliberately. They had Brian hang out with apes who were younger than him, so that he could learn what he'd never been taught as a kid: play. By 2001, after four hard years of therapy and improvement, Brian had begun to integrate into the Milwaukee troop. The zookeepers saw it as significant that a new mother let him touch her 10-day-old baby, and over the the next few years, his behavior became more and more socially aware. They peg his 16th birthday, in 2006, as the time when he "started acting his age." He loves carrying around the babies in the troop, and even managed to have his own children. And, as his keeper Barbara Bell recalled, he went off Paxil at some point, after he took to sharing it (!) with the other apes. In the end, bonobos aren't so different from our species. A combination of carefully controlled drugs, a supportive social network, and basic empathy can help anybody - human or animal - transition from suffering to thriving. It took a troop of apes, and a psychiatrist, and a little Paxil. 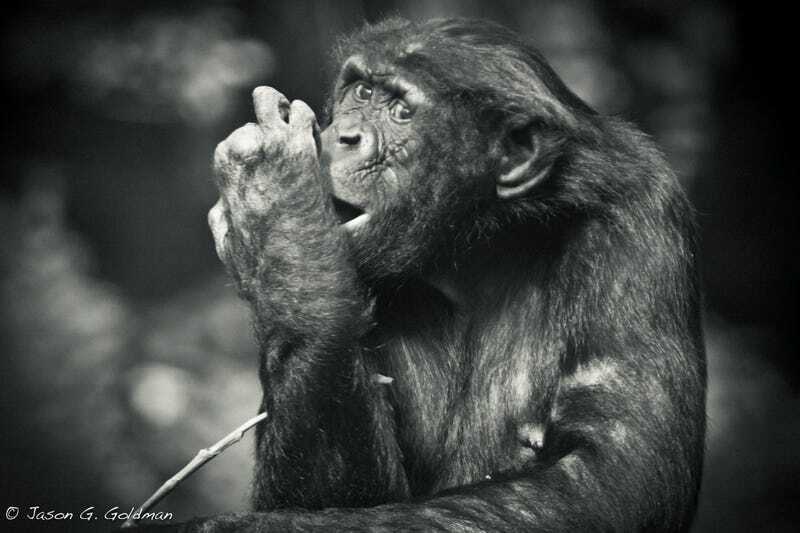 Header photo: A bonobo at the San Diego Zoo, copyright Jason G. Goldman.